You can learn more about LDS Temples and what happens inside them here. In the Church of Jesus Christ of Latter Day Saints we have been blessed to have a living prophet on the earth. We believe that God loves us just as much now, as he loved those in ancient years. So he has blessed us with a prophet that can give us direct direction from God. Prophets have been commanded by God to build temples. Likewise, we are commanded to go to the temple to receive blessings and revelation of our own. Many different ordinances are performed in the temple, you can learn more about them in the link above. 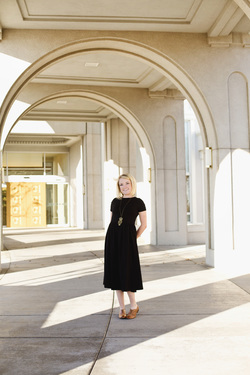 I would like to share my personal experience when I first entered the temple, and I don’t want to be bogged down by explaining everything. Leading up to the day I was to enter the temple I was told a lot of things by my friends and family. They told me I wouldn’t understand everything at first, or that I would be overwhelmed, or even that I wasn’t ready. This was meant as advice, but only burdened me. I decided to ignore everything anyone told me, and do what I knew was right. I knew I had to get to the temple at any cost. Purchasing my temple clothes (i.e. white dress clothes) with my mom is something that I will remember and cherish the rest of my life. When we found the dress that I would wear the rest of my life when I enter the House of the Lord it brought to mind all the decisions that lead me to this moment. In each image that crossed my mind my mom was standing right by my side. It brought to life the reality of eternal families. Suddenly I knew that my family would be there for me forever no matter what. Yesterday I went through the Temple for the first time to receive my endowment. It was honestly one of the most spiritual and personal experiences of my life. I was so humbled and filled with amazement. During one part of the ceremony all of your sins are forgiven. I felt as though my whole being was shining. I felt so light and perfect in that moment, I want to remember it the rest of my life. Having my Grandpa Culley there (who has now passed) was such a blessing. It was such a tender moment to hold his hand in the Lord’s House. He was so strong to come. He had been sick for so long. My grandma was so strong to help him through in his wheel chair. Just as she has my entire life, my mom lead me through all that I had to do. It was such a blessing to have her there, and I will never stop being thankful that she was able to come through with me. I am so blessed to have friends like Mitch and Megan. They both came to support me. It was such a comfort to see Mitch and Megan’s faces smiling at me from across each of the different rooms. When it was all over and I was walking to join my family. They were waiting there in the temple, beaming at me form across the room. My friends were there too. I imagine that is what it will feel like when I walk into the kingdom of my father. In the temple I met a woman from Greece. She told me that she is a convert to the Gospel and for four years she was mean to the missionaries but they never gave up on her and now she has translated all the temple videos and hymns into Greek. She has done ordinances for over 1000 people. She told me with tears rolling down her papery cheeks to never become discouraged by mean people, because they need your kindness most. I’ll never forget the love and gratitude in her eyes as they brimmed over with joy. I think I am in love. (No not that kind of love). I’m in love with my life. I’m in love with my family and friends. I’m in love with my call. Everything is finally looking up. My heart is overflowing. I'm a twenty year old girl who loves to laugh and love. I'm also a Mormon. Serving an LDS mission is my greatest joy. Thank you for joining me on my journey.